Order Whole Earth No Caf from the Online Health Food Store UK. 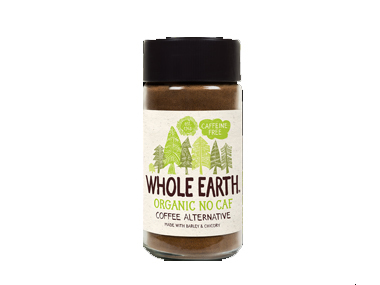 Buy Whole Earth Organic NoCaf 100g and other quality Coffee Substitutes safely online in the UK. Whole Earth organic no caf. Put your feet up with this organic, caffeine-free alternative to coffee, made with organic barley, ground chicory, roasted figs and malt. Our UK Health Shop sells real Whole Earth and other Coffee Substitutes from top-quality brands safely online to customers throughout the United Kingdom in England, Wales, Scotland and Northern-Ireland. View more products on the Online Health Food Store from Whole Earth. Where to buy Whole Earth No Caf safely online? Shop at the Online Health Food Store if you are wondering where you can buy Whole Earth Organic NoCaf 100g safely online in the United Kingdom.